Read all about UEI's first graphical touchscreen remote control. The One For All brand of remote controls has been a popular mainstay for many years. Their product design philosophy has always followed the KISS principle: complete simplicity for both programming and operation. But beneath the skin of even their most inexpensive remote controls has been an advanced, hidden substrate that provides near total customization of their products. That’s just one of the reasons their Cinema and Producer line of remotes have been so popular, even as accessory items to other remote controls! But up until now, One For All has been targeting the large hard-buttoned mass-market, selling hundreds of thousands of economical models in major chain stores. During CES 2000 I was treated, by the original manufacturing company Universal Electronics, to a demonstration of their new excursion into the high-end touchscreen segment; then titled the Mosaic. Once again the Mosaic had been designed with simple configuration and operation in mind. Although it was not then decided whether the Mosaic would even be sold under the One For All brand in the retail market, they had big plans for it in the OEM channel for cable and equipment providers who wanted to provide a deluxe but cost effective solution. But, later that year, an announcement confirmed that the Mosaic would indeed be available to the average consumer as the One For All URC-9900 Director. The now-available Director is priced at $399 USD MSRP, placing it squarely in competition with other LCD remote controls that already enjoy established markets. Can it compete effectively in what is rapidly becoming a crowded niche? 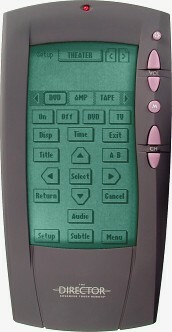 Physically, the Director "Advanced Touch Remote" features an abundance of curves arranged in a modern, angular design. 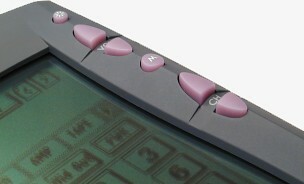 The top and bottom of the remote curve outwards, whilst the entire bezel enshrouds the screen in a smooth, wavy design. Located on the upper-right side of the remote are six stylish hard buttons dedicated to channel, volume and backlight controls. Aligned along a curved ridge, the hard buttons gently bend both inwards and upwards – though the sharp crest can present a slightly sharp tactile experience. A full half-moon curve extends from one side of the remote to the other, with an oval concave indent placed around the battery compartment. The sweeping third-dimension curve makes the remote remarkably thick, reaching up to 1.75" (4.4cm). The remainder of the remote isn’t exactly svelte either, measuring 7.3" long and 3.6" wide (18.5 by 9.1cm), weighing 13.5oz with its 4 required AA batteries (not included). Yet this ample case encloses one of the largest LCD screens I’ve seen on a graphical LCD remote. The screen region measures an impressive 2.4" wide and 4.5" high (6.0 by 11.4cm) with a 4.9" diagonal (12.4cm). Of that, 2.3" by 4.25" (5.8 by 10.8cm) is actually utilized, with a 4.8" (12.2cm) diagonal dimension. The screen’s resolution, at 160 by 240 pixels, is a little low for its size, resulting in a DPI (dots, or pixels, per inch) of 69 by 56. Nevertheless it’s more than enough for simple text and boxes, or really any simple shape they may choose to display. But since the screen only displays two colors, black and white, no grayshades are available for enhanced (AKA "more interesting to look at") graphics.